On the cover: The evolutionary history of birds such as the hoatzin (Opisthocomus hoazin; pictured) has been difficult to resolve. This special issue focuses on the avian phylogenomics project, which sequenced 45 bird species from all major avian clades. Using this data, studies analyzed the phylogenetic relationship of birds and explored aspects of avian biology. See page 1308 . Zhang, G., C. Li, Q. Li, B. Li, D. M. Larkin, C. Lee, J. F. Storz et al. (members of the avian genome consortium. 2014. 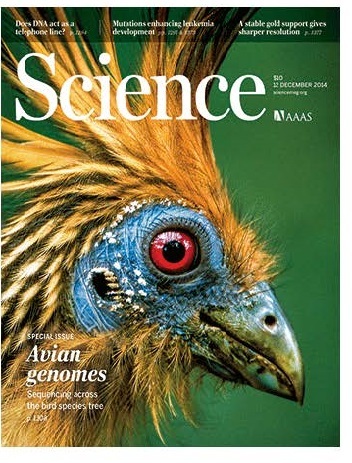 Comparative genomics reveals insights into avian genome evolution and adaptation. Science 346(6215), pp. 1311-1320.